A cold but bright and dry January morning saw a bunch of St Peter’s AC runners head to the woods for the 6th race in Born 2 Run’s Forest Run series. The venue was the scenic Gosford Forest Park, just outside the village of Markethill. Team St Peter’s were represented by; Stephen Dunn; Patricia Thompson and Marty Timlin, taking on the 10k route. In the 5k race we had Joanne McCauley and Mark Cornett. 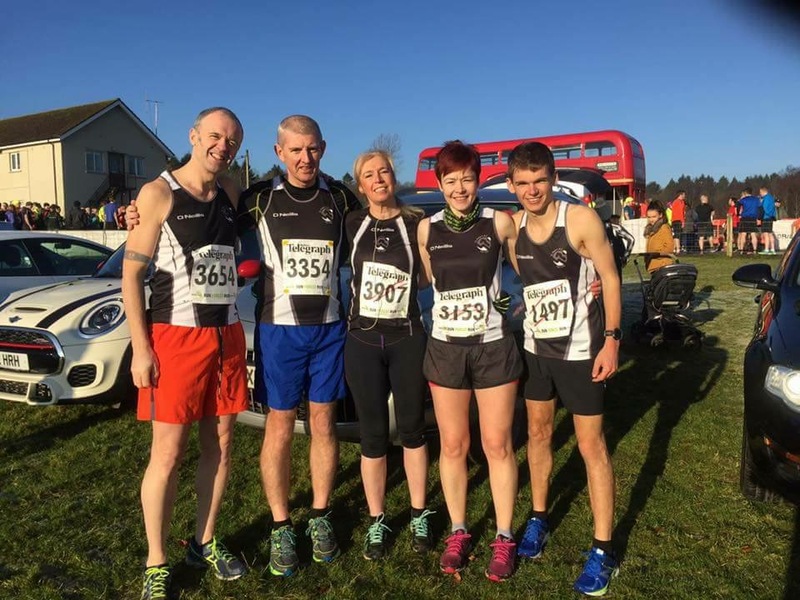 We even had a couple of course marshals helping out from St Peters – Katie and Paul Moore.Born 2 Run Events began the Forest Run series 5 years ago and promised to deliver ‘Great Races in Great Places’. The initial Forest Run series had only 4 in it – due to its popularity it expanded quickly, with 8 races in this year’s calendar. The Gosford run bearing testament to this with just over 530 entered for the 10k race – and 150 in the 5k. They attract a mix of runners of all abilities. So what is the secret of the Forest Run series – Besides being in great locations – What keeps the big numbers coming back to them year after year? I don’t think it is the pricing – £20 per race and the promise of a tee-shirt if you complete 6 out of the 8 races. In fact, you would think that would be a deterrent! Tollymore forest 10k January 7th 2017 St. Peter’s Club members racing were Stephen Dunn, Marty Timlin 10k. Running the 5k were Joanne and Meadow McCauley.Another great race from Born2run on a mild winter morning in Tollymore forest. These races are really well organised and this one didn’t disappoint, being the largest one of the series so far. Dynamo Dunno finished with a time of 45:53 and I finished 50:11 which was an improvement for both of us on our previous times for this race. 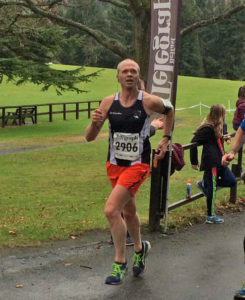 Like all the forest runs, this is a tough race, with plenty of undulating hills and tree roots to negotiate making it harder to maintain good running form. That said, it was a really enjoyable race. Meadow did herself proud and finished second female in the 5k race, and mention must be made of her mum, Joanne, who also ran a good race despite feeling under the weather. Kilbroney 17 Dec-Born 2 Run is the fourth in the forest series from born2run. It was a perfect race day weather cool, crisp and dry. 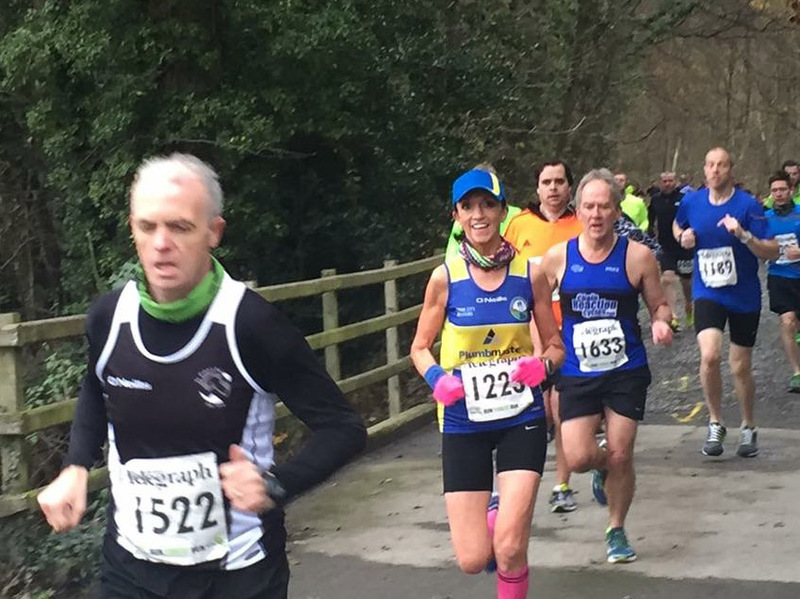 Starting in the centre of the picturesque village of Rostrevor, the fourth race in the series took runners on to forest paths which overlook Carlingford Lough, along the Kilbroney River at the Fairy Glen, and into the impressive 97 acres of forest. A tough course with 2 long hill climbs through forest trails, at times down to single file but not to many overtaking in the steep climbs.I would highly recommend this race for a good time as overall it’s a pretty challenging course. A good fast finish and good support makes this an ideal Christmas race. 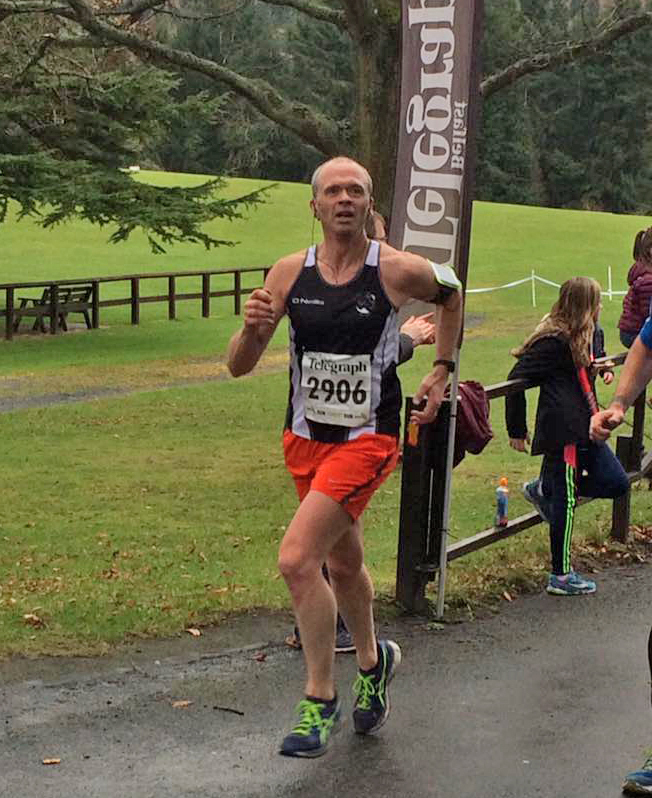 Parking, toilet facilities and post race refreshments all score 10/10. The craic, commeradary, the great bling all make this a must for the 10k race series, and a great race entry of over 600 runners. Well done b2r! Monnowburn-Born 2 R un 5th November is the first in the forest series from born2run. Starting at Mary Peters track the home of athletics ni it is 1.5 laps of the track then onto the towpath at minnowburn for approx 5.5 miles before finishing on the track. It is my 3rd time doing this race. It is a cold and crisp morning but thankfully dry.My plan was to beat my time from 2 years ago and I’d be happy enough. There is a couple of hills to contend with which you just have to put your head down and plough on. Nearly 700 completed the 10k this year and nearly 100 doing the new 5k option so it has doubled in numbers since I last did it in 2014 . I came in 9 mins quicker than 2 years ago so am very pleased with that. I would highly recommend these races they are good for over the winter months when there’s not many other races on and the medals are really good. Berlin Marathon 2016 The Berlin Marathon is one of the biggest events in the world’s athletics calendar. Having eventually secured a place, I was filled with nervous anticipation about the prospect of participating in such a prestigious race. I had set myself a target of going sub 4 hours in 2015 and had allowed myself two bites at the cherry, Derry and Berlin. Unfortunately due to my naivety, in regard to tactics, I failed to achieve my goal in Derry. I set off too fast, blew up at the 20 mile mark, and staggered over the finish line with a time of 4:01. I had learnt a valuable lesson that day. Marathons are dangerous animals that need to be treated with the utmost respect. If you don’t give them respect you will be severely bitten as I was that day. I was determined to stick to my plan in Berlin and with the aid of Hal Higdon’s intermediate marathon plan I trained diligently over the ensuing months. Before I knew it, I was on the flight bound for Berlin. My wife Mona accompanied me on the journey. She understood how much this meant to me. We headed straight out to the expo which was located at the disused Tempelhof airport. It was absolutely enormous and took forever to reach the bag collection point. This place was amazing and was a hive of activity. The following day was the eve of the race. We had planned to take it easy. So much for our plans, we ended up walking miles that day taking in as many sights as we possibly could. Not ideal marathon preparation though. Berlin is a wonderful place to visit with its history and diverse society.Race day finally arrived. It was a crisp calm morning with clear blue skies, just perfect for running. We made our way to the famous Reichstag building where the throngs of competitors were assembling. Mona wished me luck and I made my way to my starting pen. My nerves were tingling with apprehension as the gun went off to signify the start of the race. We were on our way, all 30,000 of us. The support along every inch of the way was phenomenal. Bands and an array of other artists punctuated the route. It was a carnival atmosphere throughout and I savoured every minute of it. I cruised through the halfway point in 1:50. I had composed a playlist for my ipod to carry me from mile 13 to mile 20. I actually sang to a couple of those tunes. God help the runners who were within earshot. At the 20 mile I was surprised how well I was going. I was still holding an average of 8:23 minute mile pace. I discarded the music at this point. This is where a marathon really begins. At mile 23 fatigue was rapidly setting in. The demons in my head were begging me to stop. I had to cast them aside to realise my objective. I knew I hadn’t far to go because I could see the Reichstag in the distance. Finally I made my last and final turn onto the famous Unter Den Linden and I could see the Brandenburg Gate in the distance. Suddenly I felt revitalised. I heard Mona call my name as she urged me to keep going. As I crossed the finish line I stopped my watch at 3:43. I was completely and utterly shattered but overwhelmed with elation and pride as I knew I had broken the 4 hour barrier for the first time. I will treasure my memories of running the Berlin marathon for as long as I live. For anybody contemplating running this race I would advise them to go for it. Berlin is an amazing city and its marathon is one of the world’s best.I would like to thank St Peters AC for welcoming me as one of their members. It is a privilege to run with the club. This would not have happened without them. I would also like to thank Dwyer O’ Connor, Frankie McKay and especially Paul Mulholland who joined me for some of my training runs. 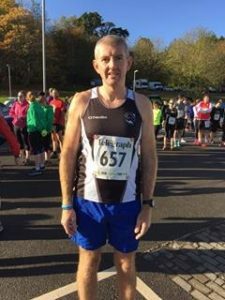 Paul gave me great encouragement and put himself out to help me prepare for Berlin.Review by Colin Conway. 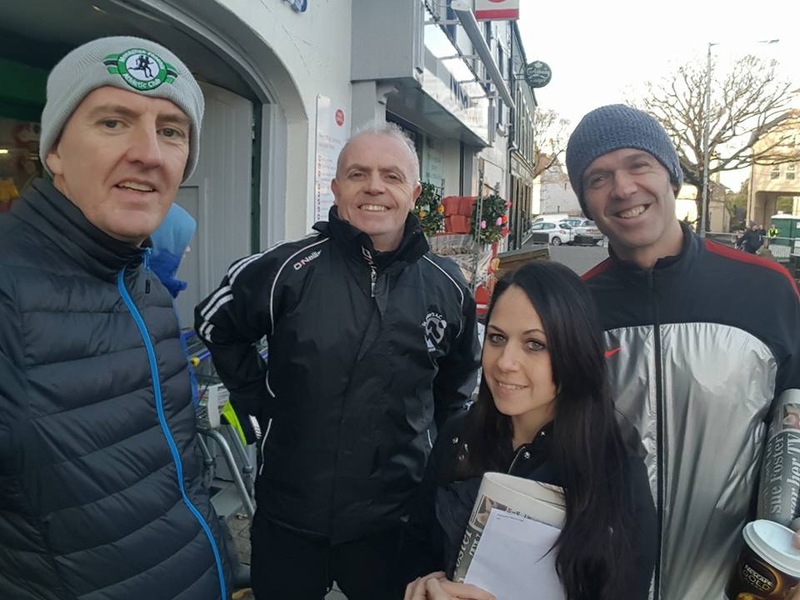 London Marthon Its one of the ‘Big 5’ (no I am not talking about Eunan, Dwyer, Connor Skelton, Trevor and Paul Mulholland) alongside Berlin, New York, Chicago and Boston; and its up there in marathon terms for a real reason. Anyone who has ever been fortunate enough to run the London marathon will testify to the whole occasion being an unforgettable and truly memorable event. It extends far beyond simply 26.2 miles around the streets of London, and if the opportunity ever presents itself for any runner or would-be runner to participate in the event, then there should never be any reason for hesitation or doubt!Every marathon is 26.2miles (unless you ask Barry Shanks about his experience of the Mourneway Marathon!!) but every marathon is different and unique in their own special way, and every runner will have their own personal favourite, but for me, London is the pinnacle for sheer scale of it all when it comes to marathons. Starting off in Greenwich you pass by all the landmarks you would expect from London; Cutty Sark, Tower Bridge, Canary Wharf, Tower of London, along the Embankment, Big Ben, Birdcage Walk, Buckingham Palace and the Mall…….a bit like the London Sightseeing Bus Tours, but minus the bus!! !Marathons are never easy, no matter where and when they are run, and are the culmination of months of training and preparation, so also come fraught with trepidation of what ifs and maybe’s could go wrong on the day itself after all that training, to prevent you crossing that finish line (biggest fear I have always had is of Connor Skelton watching me being lifted onto a stretcher along the route in which case I could under no circumstance return to Lurgan; but I’m sure he would say the same about me!). London is not simply a few hundred like minded runners out for a Sunday morning long run, rather 38,000 or so runners all running at various levels and for various reasons in the glare of the watching world! The enormity of it all tends to kick in upon arrival at the Excel Arena for the expo and pack collection. If you thought being nervous was sitting beside Eunan at the Christmas Dinner and trying to eat your own dinner before the Vulture swoops, then walking around the Excel and seeing literally thousands of runners, from all walks of life and parts of the world, and visiting the various stands and demonstrations on show, brings home the reality that this is it; no backing out now; every week during those long runs thinking about getting to this point is now upon you……time to do the needful in these situations……..brick it!!!!!!!!!!!!!!!!! As you return to the city centre and your park bench, sorry I mean the Ritz Hotel, for the night prior to the marathon, you get your preparations well and truly underway. As the saying goes fail to prepare and prepare to fail (and not as Eunan Magee is forever saying ‘A Kebab A Day Helps You Work Rest & Play’!). Every wee detail needs planned out, you go through your checklist…….set out your running attire, your fuel foods and drinks, your race number, money, phone, pre and apres run snacks and warm clothing and then you try and have a healthy, carb filled evening meal (no Eunan not the mixed Kebab with half chips, half rice!) complete with plenty of liquids (no Dwyer 12 cans of Steiger doesn’t count either!). Then off to retire for the evening and try and get a few hours sleep. Needless to say most pre-marathon nights are spent tossing and turning thinking everything through and every permutation about what may happen the following day…….very few don’t have this restlessness, but what Dwyer and Eunan got up to in Derry (one room, one double bed, no pyjamas, & no sleep) remains strictly between them and the viewers of that best selling adult DVD ‘2 Men and A Little Bed’! Arrival at the underground station on race morning and the thousands about are not the commuting public but rather the participants all making their way to Greenwich Park. There’s a real good buzz around the place and along with the nerves there is a genuine feeling of excitement as well. 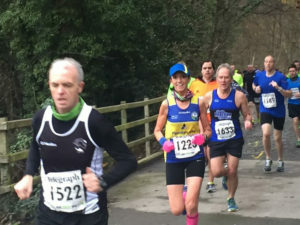 The run itself is excellently supported by the public – the first half of the marathon takes in the south side of the river, with every small pub open and supported by brass bands and dj’s encouraging every runner, and all this in addition to the throngs of locals willing every runner, not just familiar faces, to get through the race and enjoy themselves! Tower Bridge marks approximately the half way point, before you venture into the north side of the Thames and the final 13 miles towards the home stretch of the Embankment and Buckingham Palace. From this point on the crowds are literally 3 deep both sides of the road and whilst the body begins to suffer, the head starts to wonder why, and the doubts of finishing become increasingly to the fore, the crowds give you that extra wee step and belief that you must carry on and finish. Dublin Marathon will always be one of the best around for the crowd support.October Bank holiday Monday generally sees a lot of people making their way towards Merrion Square for the bag drop and then on towards the various Wave areas in anticipation of the starters gun. You’ll meet an assortment of people some young and some not so young (no names) and all shapes and sizes. There’ll be first timers or the more experienced but no matter what there’ll be plenty of nerves. People from near and far, all in the finest of gear and gadgets galore. If you are lucky you’ll avoid getting hit by a bin bag or refuse sack on the head.Starting on Fitzwilliam Street Upper heading around the small streets of Dublin towards Phoenix Park but nowhere near O Connell Street anymore. Into the park around the Zoo and along Chesterfield Avenue, you should hit the 10k mark and hopefully you’ll be right on pace. Looks like there’ll be another slight change to the route this year going out of the park by Castleknock Road, don’t forget to pay your M50 toll by 8pm the next evening (most should have finished by then). Parts of the park can be fairly quiet while other parts are maybe 3 deep with spectators cheering all the runners on.